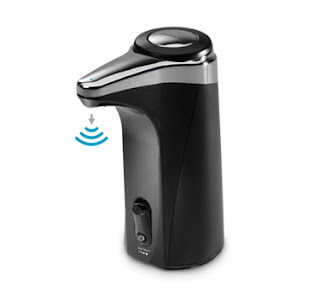 Most lotions and soaps are compatible with the Simple Human Sensor Pump. It is made of durable ABS plastic and holds up to 8 fl oz of your favorite soap or lotion. An LED display lights up when the sensor is activated. Four volume settings allow the pump to dispense preset amounts of soap or lotion! And most importantly, filling/refilling is easy! You just remove the top cap and pour in your soap. I love my new Sensor Soap Pump - it goes perfectly with my stainless steel & black appliances and keeps my kitchen counter looking tidy! The Sensor Pump comes in white or black plastic and retails for just $29.99 - so it won't break the bank! One lucky Frugal & Fabulous reader will win a Simple Human Sensor Soap Pump! *Tell me your favorite product from the Simple Human site! You have until Thursday, January 14 @ 7pm EST to enter! (Winner must respond within 48 hours.) Giveaway open to U.S. residents only. I have the fingerprint-proof rectangular trash can in 50 liters. It is awesome and definitely worth the investment! Oh dear I am afraid being first is not lucky - hope I am wrong. I love the no fingerprint trash can as well as this soap dispenser. All the products are neat though! i am a blog follower! i hope i win! and i love the fingerprint proof trashcan (which i own! )let's hope i win this awesome giveaway! I also love the fingerproof butterfly recycler! I entered your divado giveaway! I'd love the grocery bag holder! I would love to have one of the recycle trash cans! Lots of neat stuff. I like the fingerprint proof trash cans too. I've entered the divado giveaway too. My husband has been DROOLING over getting one of these soap pumps. They had one at an auction last week, but it went for more than retail(!). My grandmother has one of the trash cans, and it's fabulous! I like the bamboo square open can. It would match my kitchen. I also have the fingerprint-proof rectangular trash can and love it. I was reluctant to spend that kind of money for a trash can but I am glad that I did. The fingerprint proof trash cans are my favorite. Christina Wandry- I love the flip lid recycler. We have 2 trash cans (1 trash, 1 recycle) in our kitchen and it would look a lot better only having one. :) Thanks! I so could use the utensil holder since my last one fell apart! I entered your Divado giveaway. I like the utensil holder. It has a sleek awesome design. I like the corner shower caddy....wish I had that in my last apartment! I love the bamboo cabinet organizer! I like the spout sensor soap pump. It looks so awesome. I'm a fan of Frugal and Fabulous on FB. I'm a fan of simplehuman on FB. I am a fan of Simple Human on facebook. Thanks for the giveaway. I think this pump is a great idea, I'm tired of soap all over the place (or no soap at all!!) On the site I would like one of those garbage cans to replace the ugly one I have! LOL! I follow you blog also! Thanks again for the giveaway! I would like to get one of their napkin holder/dispensers. Looks great and really functional. I follow your blog through google. I entered the Diva Do Giveaway. I am now a fan of Simple Human on facebook. I follow you blog through feedburner too. I entered your Cover Bee Giveaway. i love the sink caddy! ike the soap dispenser best on the simple human site. I love the giveaway item, which would get lots of use...but I also like the shampoo and soap shower dispensers too! I would love to get the fingerprint-proof steel bar step can also. I like the stylish toilet brush...I know yuck! But it would really work in my home. I have one of their trashcans and its awesome. I have had my eye on this handsoap thing for a while though. I love the fingerprint-proof trashcan, that would be a fabulous addition to my kitchen. I like the in-cabinet trash cans. My favorite product is the sensor soap pump that has a clear back to let you know how much soap is left. I like the fingerprint proof trashcan. I entered the divado giveaway. I like the grocery bag can with bag holder. It would be perfect in my small kitchen, especially since my dog has managed to find a way to get into every other garbage can! I entered the Cosabella give away. front load recycler looks really handy, thanks! My favorite product is the sensor soap pump. I also have the fingerprint proof rectangular trash can.